Andrew, The DPI feature looks interesting, however as I read the manual, it describes where to set it but not what it does. I want to limit or block P2P traffic. What is the effect of setting the DPI parameters. For example, I have a rule that sets a quota to an IP address. This works well, and just like the previous versions. To test the effect, I set a rule for my PC and all is as expected. Then I start Bittorrent and the bandwidth goes up. All good. Then ( after having selected all P2P options in the settings), I turn on P2P under even more settings in the rule. Nothing seems to happen. This makes sense to me as I am already capturing all traffic in the rule settings for that IP address. I must be missing the point, can you please explain its use or give an example. It may not be very obvious, but here is how it works. 1. In the global settings you only define which protocols are detected in each category. 2. In the rule properties, at the Advanced tab there is a Even more advanced settings button, which opens this dialog. Now, when you create a rule, make it like this. Then in the Advanced Rule Settiings tick P2P under DPI matching. 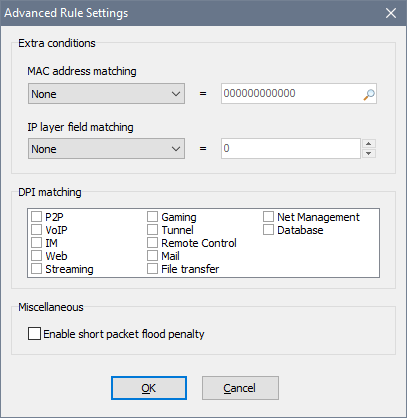 This will make the rule to only match P2P protocols from the list in the global settings. In other words, you can choose which DPI categories the rule must be checked against. So for a particular Ip address I would have to make 2 rules. One for normal traffic and a seperate restrictive one for the traffic detected under DPI. Would it be possible to include DPI in penalties.